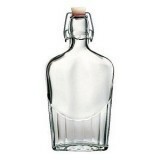 Also known as "Latch Lid Flasks" "Air Tight Flasks" "Glass Pocket Flasks" "Hermetic Swing Top Flask Bottles" "Seal Tight Swing Top Flasks" and more! Great Flasks for Storing, Preserving and Displaying: Wines, Oils, Vinegars, Limoncello, Liquors, Liqueurs Water, Syrups and more! They Make Wonderful Gifts For: Holidays, Weddings, Birthdays and more!